For a child, twenty dollars can seem to be a huge sum of money. I know that, for my seven year old self, that twenty seemed like a giant sum when I went to open my first bank account. It took over a year before that little bank account grew up to 100 dollars, but even that admittedly small sum, seemed enormous. After several years of childhood savings, I remember my pride in having an account that had reached 500, that was a lot of bags of leaves, garden weeding, and slug picking to get that high. Particularly when I had a fondness for spending my money at The Dollar Store. When I was ten, things started changing and I became more entrepreneurial in my endeavors. Knitting, felting, and many other craft techniques went through my hands, and each presented a few items that had the potential of being sale-able at craft fairs and farmer’s markets. Sometimes I would sell for other people at the markets, making a small commission on the products that I sold. And, slowly and steadily, my bank account grew. Thanks to my own early savings, and the savings set in place by my grandmother and parents, I did not have to worry about money for my first two years of university. I didn’t have plenty, but I had enough so that I could focus on learning and on working and saving for my third and fourth years. 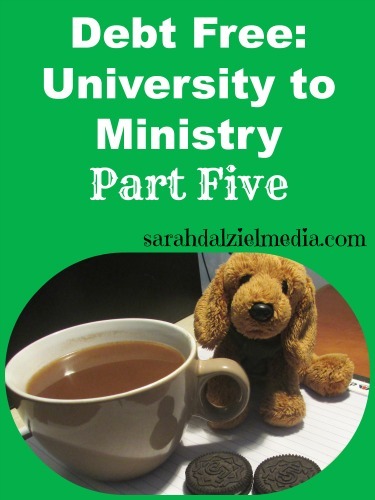 This is the fifth part in a series on remaining DebtFree from University to Ministry. If you haven’t seen this series before, make sure to check out Part Four and the other earlier posts. One benefit I found from setting a “saving habit,” as a child, is that I am more conscious now of the money I spend and the money I save. Having already had a “spend, save, give” style basic budget in my elementary school years set in place my ability to talk myself out of many impulse purchases. Sometimes I will buy a “treat” food, but usually when I go to the store without a specific treat in mind I talk myself out of it. Did early savings really give me much monetary advantage? Not really, just savings alone did not give a great advantage, maybe a few thousand in total. But combined with my three years in the science fairs and saving those winnings for university (except what I used to by my first laptop), I was able to pay completely for my first year university without touching the education savings fund. Of course, I had one advantage in my first and second years of university, I was actually saving money by attending an American institution due to the higher exchange value of the Canadian dollar in those years. During the university years, I had three primary sources of income. My VA service, my fiber to craft show efforts, and working for others in the community. Of these, the most versatile was my VA service. I could do it anywhere I had my laptop and an internet connection. The craft shows were less versatile as the show itself took a minimum of three days for a one day show, or four days for a two day show due to preparation and recovery time. And the least versatile was that of working for others in the community, namely being a custodian and a camp cabin leader. Being a VA was the most versatile as I could dictate my own time of working, and how much time I would give to a given person. Usually it was a few hours a week, and I would do whatever needed to be done by a certain day of the week. I had one VA project that was daily, which was challenging. Craft shows are a gamble, unless you have visited frequently and know the event before you go, you could end up at a well-attended fair, or one where the vendors are mostly occupied in buying from each other. Depending on the local economy, a craft fair could also either be a bust, or a boom. Sometimes one would barely sell enough to cover the booth costs, other times it would be awesome. Working for others may be slightly more secure than doing craft fairs, however, it also means that you dance to their piper. As someone who began their money earning with being an entrepreneur, while the paycheck is nice, the structure is a pain in the rear end. And, as more frequently happens, the work ends up being harder than the money is worth. The one other experience I had with working for others was that of a temporary farm sitter. I did it for one year, from spring to late fall, and while it started out well the final engagement left a nasty memory. While I had no open breach with my employer, we have never spoken since and I have no doubt that the kinds of things my employer told me about her previous farm help was said, about me, to the next farm help she had. I do not grudge the work or the time, and was grateful indeed for what I earned doing it, but unless I knew the farmer well I would not farm sit again. Almost anything you do will be trading money for something, usually time, effort, or expertise. While sometimes you can turn the equation to your advantage, it will usually end up being to the advantage of the person you are working for. The challenge, therefore, is not working harder but smarter. For example, I took up ghostwriting and beta-reading because I both read and write fast. This enables me to charge less than many people and still make a decent hourly amount for my effort (usually in the range of 16-20$ an hour US). Another way to leverage your time, is to do something once that can be sold again and again. A knitting pattern, or woodworking pattern is an example of this practice. More toward writing, a novel or non-fiction book is also an example, or an audio book. The challenge of this method is that of getting your product before those who will want to buy it, which is a whole other ball game (but a fun one). Perhaps I will get into that more later, or in another article series. What ways would you suggest a youth or young adult prepare for going to university? If you have experience income-sourcing, what would you suggest as a good way to make the best of a challenging job market and an increase in entrepreneurism? I love hearing from you, leave a comment and if you found this article informative, challenging, useful or otherwise interesting. Please remember to share it with your friends or others who might find it helpful.